Hi there! I’m Thomas Frank, the founder of College Info Geek. That’s me on the left in the pic above. Mt. Fuji is on the right. Only one of us writes for this blog. If you’re a college student (or even a high school student) looking for ways to study more effectively and make college an all-around awesome experience, you’re in the right place. Hack your studying. Learn more in less time, study and work more efficiently, and teach yourself the things you can’t learn in class. Get the jobs you want. Build a great personal brand, promote yourself effectively, and forge useful relationships. Build a solid financial base. Pay off your student debt, learn how to manage your money well, and start saving for the future. Want to know where you should start? Well, here’s something I think you’ll enjoy. 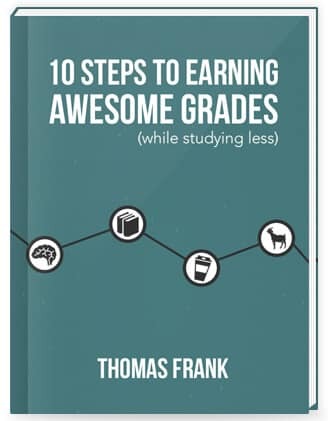 I wrote a free book called 10 Steps to Earning Awesome Grades (While Studying Less), which compiles the years of practice and research I’ve done in order to answer many of the questions students have about studying and learning. …and more. I released it in January of 2015 and it’s been downloaded by over 120,000 students so far. I hope you find it useful! In addition to sending you the book (and a couple of other bonuses, like my personal graduation planning spreadsheet), I’ll keep you updated on each week’s new videos, podcast episodes, and blog posts. I block spammers harder than Terry Crews wearing Odor Blocker Body Wash, so don’t worry about getting any of that from me. You’ll find a ton of articles and podcast episodes on this site – but my real passion right now is creating videos. I’ve found that there aren’t many channels on YouTube that provide useful advice on studying, building strong habits, and building a remarkable college experience – so I’m building one. As a lover of video games and geek culture, I also strive to make them entertaining and full of references that keep things fresh. If you’d like to see all my videos, check out the YouTube channel! Right now, there are 826 posts in the archives. That’s a lot to go through, so I’ve created a few lists of posts that you should start with if you’re new. Let’s go! These are my two “general college tips” list posts, and out of everything here, they are the most jam-packed with college hacking knowledge. Read these if you’re looking to study better in less time, increase your productivity, and hack the way you work. Check out more of the best posts in this category at the Studying/Productivity Hub. If you want to know how to promote yourself, build professional relationships, and get the jobs you want, read these guides. Check out more of the best posts in this category at the Career Hub. College is at least partly about building a stable financial future for yourself. Read these articles to learn how to pay off your debt and build wealth. Check out more of the best posts in this category at the Personal Finance Hub. Sometimes I gotta get on the mic, speak the truth, and leave my name. If you need some great audio content for your next jog or roadtrip, check these out. If you enjoy these picks, you can also see a complete listing of all episodes at the Podcast page. Want to know more about me and the story behind College Info Geek? Check out the About page.